MyKlipsPics, which Drexel University LeBow College of Business senior officially launched Feb. 14, is a mobile app that allows users to improve their experience at salons by keeping track of their favorite haircuts through pictures and notes. It’s a revolutionary way to lessen the chance of miscommunication between the stylist and client—an unfortunate struggle that most people, including Logsdon, have experienced at least once. 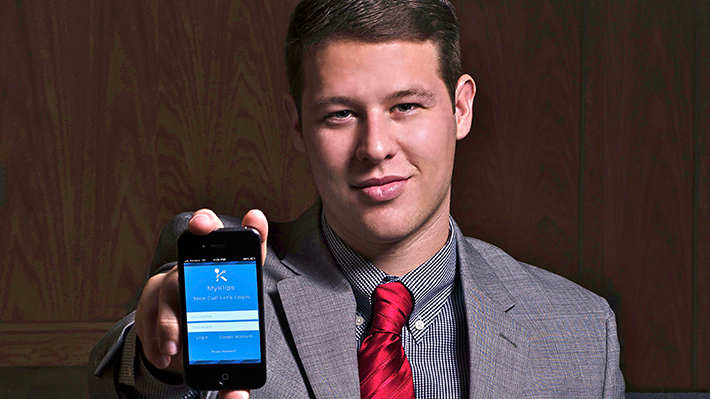 Skyler Logsdon, a senior entrepreneurship student, launched MyKlipsPics to ease haircut instructions at salons and barbershops. “The great aspect of MyKlipsPics is that you don’t describe your haircut! You walk in, open up the app, show the 2×2 collage of your previous haircut, and say DO THIS! And the barber starts cutting!” Logsdon said. The app stores photos of the desired haircut from the front, back and two sides. There’s also space for the user to save notes that describe the haircut as well as the stylist’s name, location and contact information. Stylists get a more cohesive visual and understanding of what their clients want, and the clients have a better way to express their needs. It’s a win-win situation for both sides—which is something Logsdon confirmed back in the planning stages. The idea for Logsdon’s first app stemmed from the problem Logsdon ran into after transferring to Drexel three years ago: how to get a decent haircut. Originally, he conceived of the idea as a management app for stylists, where they would save photos of their clients’ photos. But it wasn’t until Logsdon was home in California for winter break that his self-described “Ahaaa” moment occurred and he decided create the app for clients instead. “A few of my high school friends back home in California are in school now at Paul Mitchell, and a few are already cutting hair at salons, and they love the idea,” Logsdon said. He credits their positive feedback as the motivation he needed to continue developing the app. Logsdon also joined forces with Nick Pirollo, the Drexel alum who helped build the Scholly app and later worked that same magic with MyKlipsPics. Even before the app was put on the iTunes Store, it started to receive attention: Sam Lessin, director of product development at Facebook and founder of Drop.IO (which was acquired by Facebook for $10 million!) recently followed MyKlipsPics on Instagram after posting on Facebook about the need for a hairstyle app to avoid barber shop mishaps. After going live in the App store, MyKlipsPics installed the ‘Selfie’ reverse camera to create more opportunities to take the perfect haircut picture to share. Logsdon plans to manage MyKlipsPics while he finishes his final year at Drexel and after he starts a fulltime business consultant position at KPMG International in Los Angeles this summer. It’s safe to say he’ll be navigating through both experiences with an awesome haircut. Update: A promo video for the app was released on March 10. This young man has a bright future ahead of him. Geat and very interesting article.